On January 21st 2015 my life changed forever. On this day after eight weeks of continually being unwell and taking little man to the doctors over and over again to be told on each visit that Devon had nothing more than a virus. I finally got a doctor to listen to my concerns that this was something more serious and he referred Devon to the hospital that same day for some tests. Later that day in the hospital a junior who examined Devon said that she could feel a lump in his tummy and he was sent for an ultrasound scan. That was the start of the most heart-breaking traumatic and emotional journey I have ever been on. That night Devon got transferred to hospital and after more tests my little managed just two years and 10 months old was diagnosed with Stage IV MYCN amplified Neuroblastoma with bone and liver metastases. 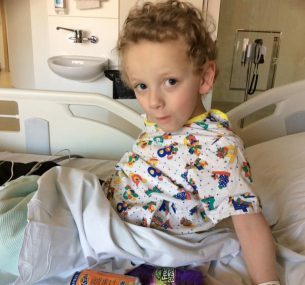 In short this means Devon had a large solid aggressive tumour growing in his belly into his liver and into his kidneys he also had small cells of the tumour in his legs and a couple in his chest. Devon became critical with the first couple of weeks of diagnosis and we never got to leave the hospital that day until the middle of March when we finally returned to our home. 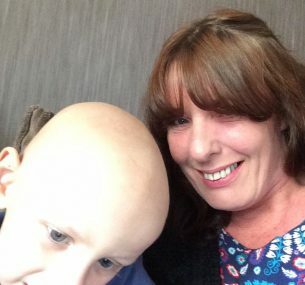 Since then Devon has endured months and months of hospital stays receiving the harshest of treatments to treat his cancer including eight cycles of chemo, removal of 95% of the main tumour and removal of his kidney. Stem cell harvest and stem cell transplant, radiotherapy and six months of immunotherapy. During this time, the most traumatic time for us. Devon developed sepsis in his bloodstream from an infection in his central line going into his chest and had to spend a week in intensive care on a ventilator because he was so critically ill. This was the most scared I have ever been in my life. I came so close to losing my baby I was terrified but once again his strength to fight shone through and he pulled through and he carried on fighting because my boy is superman himself he is just the strongest bravest little boy who always has a smile for everyone he is a true warrior. 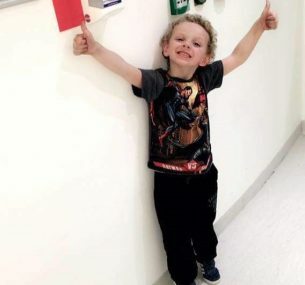 On the 27th March 2016 Devon’s fourth birthday, he finally got to ring the end of treatment bell at hospital, and on the 9th May we received the best news ever that Devon was in remission. The news that I had prayed for every single day had finally come true the cancer was gone. Two years on Devon is still in remission and is doing amazing. He still has problems due to the treatment he received, he has to wear hearing aids in both ears because the effects of the chemo and he has just been diagnosed with stage 3 kidney disease again because of the chemo but I try to always remain positive and instead of feeling resentful that this ever happened to my little boy, I consider myself the most luckiest mum alive that he has not only survived the cancer itself but the treatment to cure it as well, Because so many other children who have Neuroblastoma don’t. I’m so proud to be his mum.